Were women in ancient Athens made to stay in their homes and kept out of society? This question is hard to answer. We have almost no archaeological record of women's activities the crafts they made have been lost to time. No words come from the women themselves either almost all ancient records of Greece were written by men and for men. Ancient Greek artwork adds to the confusion. While some writings state that women were not allowed to go outside, some vase paintings show women gathered at fountains, talking together. From studying such writings and artworks, some scholars believe that women had little social or public life. Others disagree. The following statements are by four experts on ancient Greek culture. 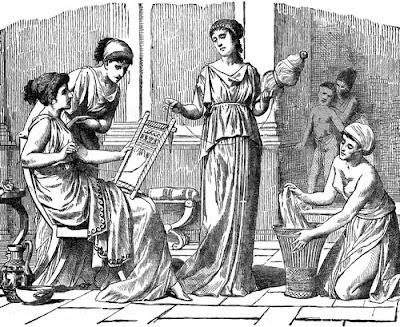 Each expert tells his or her ideas about the role of women in ancient Greek society. Their ideas are based on years of study, which has led them to differing opinions about how Greek women lived long ago. Read each statement, and then answer the questions under Compare Viewpoints. Free women were usually secluded so that they could not be seen by men who were not close relatives. An orator [a speaker in the courts] could maintain that some women were too modest to be seen by men who were not relatives. Here, then, the fountain is portrayed as the female equivalent of what the public square represents for men. It was a public place where one saw mainly women (or so the painters would have us believe). Women were virtually household prisoners in fifth- century Athenian society in particular, as the legal orations of Lysias show, and this seems to have been the typical state of affairs from shortly before the time of Homer onward. Husbands expected wives to go out and those wealthy enough gave them slaves to accompany them.... Indeed, one of the most important activities of women included visiting or helping friends and relatives. As men had their circle of friends, there is considerable evidence to indicate that women formed ... friendships with neighbors, and visited one another frequently whether to borrow salt or a dress.